We have had such fantastic weather this year, especially in London where I live, that the summer seems to have lasted forever- I’m not complaining, I am truly at my happiest with the sun shining and no need for a coat, the patio doors flung open and bare feet! It seems to have come as more of a shock, however, that it is actually October! There is also a chill in the air, the evenings are drawing in for sure…and I’ve got the heating on. Oh how I mourn the summer, but I find the only way to deal with it is to embrace the change. To light candles and cosy up and make comforting, hearty food, full of goodness to help keep those back to school bugs and viruses away! 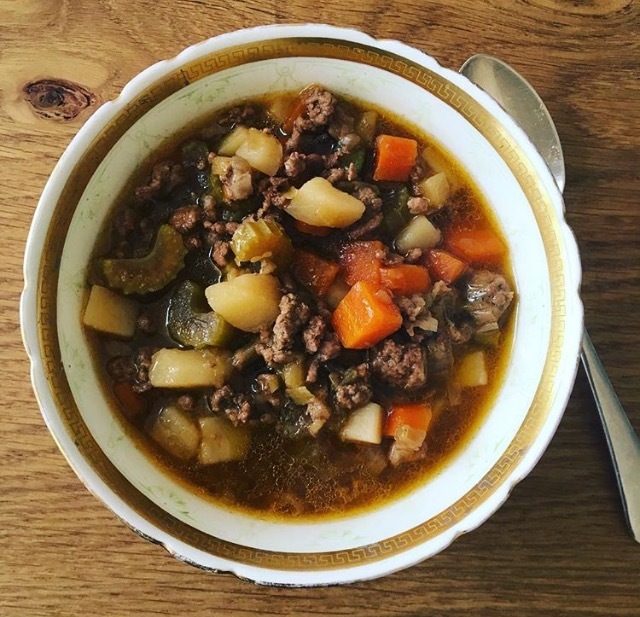 Mince stew is definitely on my “transition to autumn menu”! It’s so easy, it can be prepared in advance, it can be frozen, it can be used as the base for cottage pie or plate pie…but most importantly, it is delicious! It is a little bowl of goodness that my mum and Nanna used to make, especially when we were ill. It takes me back to my childhood and makes me feel warm and happy. I made a batch the other day and posted it on Instagram and lots of you asked for the recipe. So here it is! Enjoy! ©Lisa Faulkner & Crown Talent and Media Group, 2019.